This wing of the Hotel Xcaret Mexico shows off the lush natural environment. Spacious double rooms will have two queen beds at the new hotel. 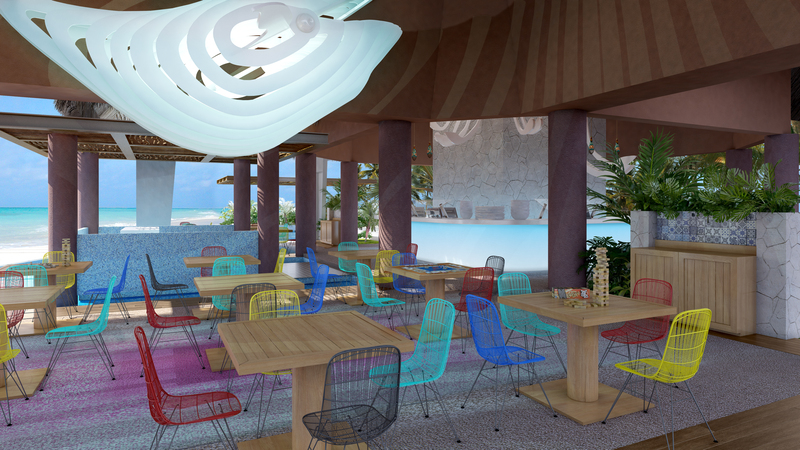 This rendering of the kids buffet shows the style of the new Hotel Xcaret Mexico resort. Edutainment may be a tough concept to sell, yet all parents and grandparents want more from a family beach vacation than a suntan and a bunch of bills. Enter Experiencias Xcaret — a family owned Mexican company which has successfully run innovative, environmentally-oriented amusement parks for 30 years. Begun with architect Miguel Quintana Pali’s purchase of 12 waterfront acres to build a home, what is today known as Xcaret has been transformed through his partnership with Oscar, Marcos and Carlos Constandse into eight eco-archeological themed parks in the Cancun – Riviera Maya region. The Xcaret “edutainment” formula is so popular that, at a recent press event, CEO Marcos Constandse said that 40 million guests had visited the parks, and they were expecting 3.2 million this year. In fact, last year, 30% of all visitors to Cancun and Riviera Maya had visited at least one of the Experiencias Xcaret parks, including 15% of all visitors who arrived in Mexico by plane. Families raised on Disney World delights are surprised to see the same level of craftsmanship applied to an all-natural environment, in which all the senses are engaged and there are endless opportunities to interact with your surroundings. For example, at Xoximilco Cancun. a landscaped jungle area laced with canals, guests are invited to board barges for a night of guided partying that includes sampling Mexican food, tasting a variety of typical drinks, listening to different genres of Mexican music and dancing. It’s faux authentic and very popular as a way to connect with Mexican culture. Other Experiencias Xcaret parks have led the trend of having more active, experiential and adventurous vacations. Already famous for taking advantage of the region’s natural cenotes or underground rivers for exotic adventures, several parks have added ropes courses and zip lines so that visitors have an all new and more extreme, way of seeing the scenery. 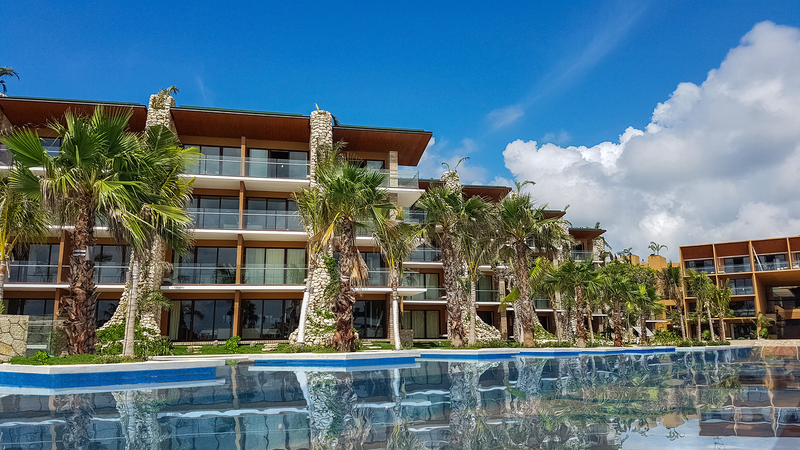 The latest news for Experiencias Xcaret is Destino Xcaret, an 890,000-acre project near the Xcaret park that will tie together four of the current parks within a development boasting shops, restaurants and 12 hotels totaling 6,000 rooms. Still committed to environmental preservation, the resort has already received the Earthcheck Planning and Design certification. 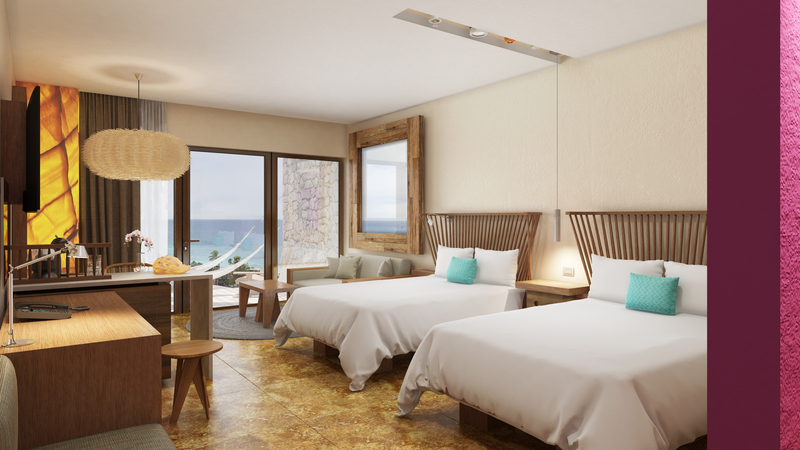 The first hotel, the Hotel Xcaret Mexico, is expected to open in December 2017 in the heart of the Riviera Maya, just 15 minutes away from Playa del Carmen, 20 minutes north of Tulum and 45 minutes from Cancun International Airport. It will have 900 rooms, all luxury suites, grouped in separate wings known as casas, with varying price point and guest amenities. Hotel Xcaret Mexico (and its 11 younger siblings) will be located in a complex designed to include the country’s largest convention center, a River Walk shopping zone stretching for two kilometers, a manmade white sand beach and lagoon, and “rivers” swirling around the hotel’s casas. Estimated to cost US$350 million, it will operate on an “All Fun Inclusive” concept with activities such as entry to all of the parks — Xcaret, Xel-Ha, Xplor, Xplor Fuego, Xoximilco and Xenses — free for guests, as well as guided tours to Xenotes and Xichen. However, this is not to be confused with all-inclusive in the sense of meals and beverages included in rates. High tech amenities, such as “smart” wristbands for entry, guest ID and park tickets, will work hand-in-glove with the butlers who serve the Casa Fuego, Casa Tierra and Casa Agua wings. At the culturally rich resort, guests will be offered a variety of eco programs and activities that focus on helping sea turtles and scarlet macaws. Guest room furniture will be hand crafted by Mexican artisans and a hand carved “cavern” like those featured in the Xcaret Park will house the main dining room. Among the 18 bars and restaurants, chef Carlos Gaytan, the first Mexican chef to receive a Michelin star for his Chicago-based Mexique, will supervise the cuisine. Again, they’re touching all the bases with today’s younger families by focusing on sustainability, cultural respect, authenticity (even if themed) and food. Planned resort programs include three fitness gyms, a spa and wellness zone, and supervised clubs for kids and teens. Babysitting will be available for a fee. For families, Xcitement is a given.